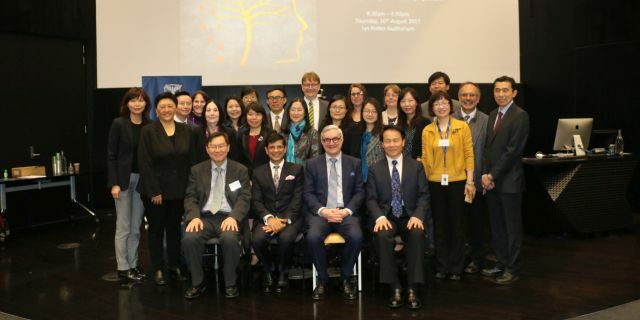 In celebrating tripartite psychiatric research and education collaboration between Peking University, the University of Melbourne and the Chinese University of Hong Kong, and highlighting Mental Health in Ageing, the Department of Psychiatry held the Annual Psychiatry Research Symposium in Melbourne on 10th August 2017. The symposium was organised by the Department's Research sub-committee led by Associate Professor Ben Harrison together with Ms Yue Li and Ms Jan Mariani. The Symposium was opened by Professor Shitij Kapur, Dean of the Faculty of Medicine, Dentistry and Health Sciences. Professor Qimin Zhan, Vice President, Peking University and Professor Yun Kwok Wing, Chairman of the Department of Psychiatry, the Chinese University of Hong Kong attended the symposium. Leading principal investigators from the University of Melbourne, the Peking University, Beijing and the Chinese University of Hong Kong showcased their latest psychiatric research and studies, which no doubt will have long lasting benefits for people with mental illness, families and communities. Keynote speaker Professor Ashley Bush from The Florey - Institute of Neuroscience and Mental Health guided the audience through his ground breaking research in Alzheimer’s disease. Early career researchers presented their cutting edge research in mental health. Award prizes for the best poster presentation went to Ms Kate Bray and the oral presentation winner was Ms Hayley Drake.